It’s been a rough week for some IT guys. United Airlines, the New York Stock Exchange, and TD Ameritrade all had very public network failures. So far, no one has claimed that anything nefarious was going on. That is, these shortcomings were not the result of any cyber attacks or hacking attempts. 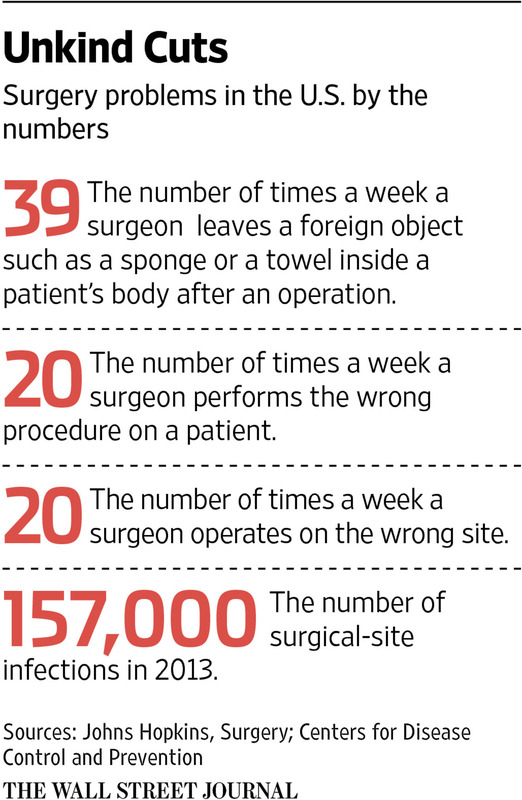 Rather, they appear to have been the result of failure in standard operating procedures. To some degree, such failures are not so much a question of if, but of when. No system is perfect and problems of one sort or another are inevitable. The question is what is an acceptable rate of failure. That is, if the NYSE cannot be guaranteed to be always working perfectly, what is an acceptable rate at which to have disruptions? The Wall Street Journal had an article that somewhat relates to this point (What We Learned From the NYSE, United Airlines Tech Outages, Jul 9). The article notes that old-fashion land line telephones had an uptime of 99.999% — that is, Ma Bell would leave you without a working phone only about five minutes out of every year. Of course, old school phone systems were regulated and nudge to that level of reliability by their overseers. Unregulated, private networks aren’t held quite to the same standard. The article claims that firms are generally unwilling to invest to the level that would raise their reliability to the level of a land line. It also notes that there are other things going on. Today’s problems with reliability are more fundamental, a reflection of the complexity of contemporary networks, the volume of data, the pace of change, insufficient organizational and cultural practices, and a legacy of arcane and poorly written business software that traditionally put little emphasis on usability or customer experience. Outages persist because of the interdependency of computer systems, fueled by the rise of digital services across all industries, particularly those with customer-facing software such as mobile apps, according to former NYSE Euronext CIO Paul Cassell, now CIO of Pico Quantitative Trading LLC. It was a bad winter in Chicago and, frankly, pretty much everywhere in the Northern part of the country. If April showers bring May flowers, then January snows bring February potholes. Or at least that is the conventional thinking, but is Mother Nature really the only cause of potholes? That is the question asked by an OR/MS Today1 article. And is there anyway not to be intrigued by the headline “Pothole Analytics“? The article is written by Lucius Riccio who, among other things, is a past Commissioner of NYC’s Department of Transportation. His contention is that the formation of potholes is not independent of how a city treats it roads and that Gotham may just have been asking for a ton of potholes. Here’s the punchline to the article. Clearly, fixing potholes is an essential and commendable thing to do. And to do so efficiently is a worthy management objective. Of course, it is not how many you fill but how many you don’t fill. Or put another way, how long do they remain in the street breaking axles and blowing out tires? But in addition, I think the fixation (pun intended) with potholes is the wrong approach. A high number of potholes is indicative of a failure to maintain the streets. Fixing potholes means the smart thing hasn’t been done, which is to do the work that prevents them in the first place. Potholes are emblematic of a failed strategy. Which is worse, having your flight delayed two hours or having your flight cancelled and being rebooked on a flight two hours later? According to Delta Airlines, customers generally prefer a simple delay to a cancellation and rebooking. That has led to Delta working hard to minimize the number of cancelled flights. According to the Wall Street Journal’s Middle Seat column, last year Delta cancelled just 0.3% of its flights — well below the industry average of 1.7% — and at one point went 72 straight days without canceling a single flight (A World Where Flights Aren’t Canceled, Apr 2). As the graphic above and the video below demonstrate, this has taken a lot of operational refinements. This blog has covered many different topics over the years. We have talked about everything from managing hospital emergency departments to supply chain risk to baseball. But we have so far ignored hard liquor. That ends today. We are going to talk about bourbon. Corn whiskey has been an industry in the US for a long, long time (remember the Whiskey Rebellion?) but, as Fortune tells it, the industry is incredibly hot right now (The billion-dollar bourbon boom, Feb 6). In absolute numbers, the bourbon industry’s $8 billion in global sales is relatively modest. (The Coca-Cola company alone has 16 drink brands with annual sales above $1 billion.) What’s extraordinary is the growth—and the fact that bourbon’s popularity appears to have come out of nowhere. According to Euromonitor, domestic whiskey sales have soared by 40% in the past five years—NASCAR-fast numbers in a sector where good growth often means 2% or 3% a year, and a revolution for a spirit whose sales declined almost without a break for 30 years. Things are even better abroad. In 2002, American distillers exported just $376 million in whiskey; by 2013 that number had almost tripled, to $1 billion, according to numbers released this month by the Distilled Spirits Council of the United States. Just what is behind the growth is open to speculation. Don Draper knocking back Manhattans on Mad Men helps as does marketing that emphasizes an “authentic” American product. However, there is a problem. Producers cannot simply flip a switch and produce more. Why do more passengers complain about United than Southwest even when the service is the same? 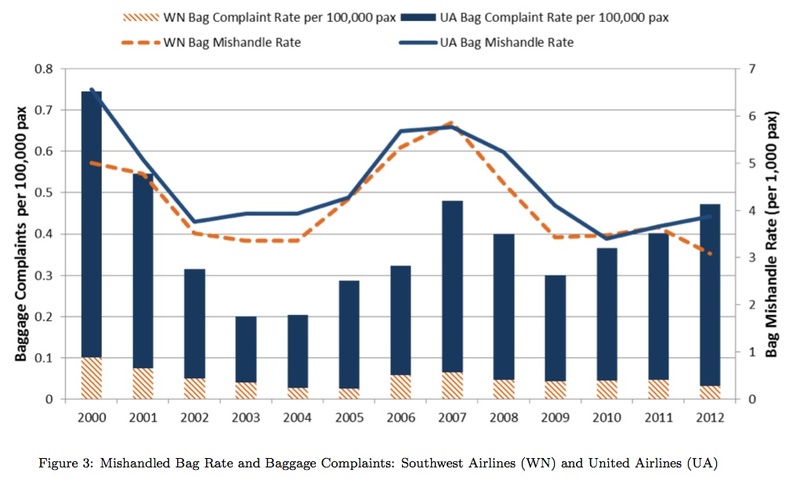 Check out this graphic that combines how Southwest and United Airlines do in handling (more specifically, losing) passenger bags (the lines) with how those passengers complain to the Feds about those airlines mishandling their luggage (the bars). To give credit where it is due, the graph comes from a working paper by MIT researcher Michael D. Wittman (Are low-cost carrier passengers less likely to complain about service quality?) which is also discussed in a BusinessWeek post (Why Discount Airlines Draw Fewer Complaints (Hint: It’s Not Better Service), Feb 6). I find this a pretty interesting piece of eye candy. It seems to suggest that Southwest is the Teflon airline — nothing sticks to it even when their operational performance is as mediocre as other airlines.